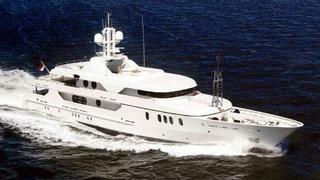 Word comes from Edmiston that they are now offering a €2 million price reduction on the 50m motor yacht Malibu. Malibu was built by Amels to Lloyds class and MCA compliant in 2001, designed by Terence Disdale. A refit in 2006 saw the installation of a new Reymond Langton interior and she accommodates 12 guests in five staterooms. Twin 1200hp Cummins engines give Malibu a cruising speed of 13 knots and a range of 5,000 nautical miles. Lying in Toulon, Malibu is now asking €19.5 million.